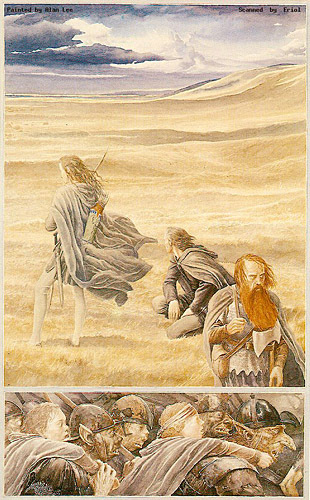 That the men of Rohan are both cautious and proud surprises me not. They have as of yet remained free of war and excel in the husbandry of horses like no other. Wealth such as their herds breeds caution in the best of times, let alone ill time such as these. Eomer is however an example of nobility and wisdom, catching in that "Strider" is more than he claims and then doing the unthinkable and lending horses to the party so that they may pursue their quarry. In modern day we think of horses as expensive, but our concept of their worth is nothing compared to what it is in a pre-industrial society. He's not doing the medieval equivalent of lending his car to a stranger, it's a lot more serious than that. Personally, I find it a bit interesting that they lose the trail, even if they can deduce where it goes. A horde of orcs does not make for exactly subtle passing. But listening to the earth is a neat trick, and I can't help but laugh at "this is the way that the Orcs went after their debate." There's a lot of good wit in this chapter, not just calling the orc in-fighting. The barbed exchanges between Gimli, Legolas, and Eomer are fantastic. Rohan is in a bind. Like anyone sane they wish to remain free of war, and they're far enough away from the front that they still have the illusion that neutrality is an option. But that illusion is close to shattering, and Eomer is at least peripherally aware of it, even if it's not something he wants to admit. He's not out hunting orcs under guidance, he's out hunting down the marauding band on his own initiative because orders would not be given. Likewise their herds have been raided by agents of Sauron when sale of mounts was refused, and they live in fear of Saruman and the shadow of the White Tower. As for the king's displeasure with Gandalf, I feel like Gandalf acted a bit out of trickster spite and necessity. Necessity due to his imprisonment, the dire nature of his news, and limited options due to the dismissal by the king of the news. Making off with the king stallion means the best mount to carry him out, but also was likely a calculated choice. In defense of their judgement of Gandalf, he is often a bringer of trouble and bother, but as a meddler rather than as the source. All that being said, to the men of Rohan (and to most of Middle Earth), Gandalf is a well-traveled man with esoteric knowledge who has some unique surprises up his sleeves. The loss of Boromir is far more recognizable as a tragedy for them. Ignorance and misinformation is rife in this chapter. Some of it is benign, beings so removed from the lives of the other races that they are considered legend if they're even known of. Hobbits seem to have worked hard on retreating from the world at large, and so that the name "hobbit" is met with confusion and "halfling" as something from a fairy tale. I can understand the knowledge passing by men, their lives are so much shorter than those of the other races. It is surprising to me that a wood-elf such as Legolas, young for his race but still long in years, would have little familiarity with the lore of ents beyond speculation and rumor. But are the rumors and suspicions regarding Galadriel a sign of the elven withdrawal or of Saron's meddling? And what is the dangerous difference between a wizard and a sorcerer that causes the men of Rohan such suspicion at how they may have earned Galadriel's favor? Perhaps the most profound statement to me in the chapter is this, "The counsel of Gandalf was not founded on foreknowledge of safety, for himself or for others." The Lord of the Rings: The Two Towers has been rated PG-13 for epic battle sequences and scary imagery. Beyond the shifting of chapter one to the first movie, the film of The Two Towers really doesn't start at the same point. In fact, it starts with the conflict between Gandalf and the Balrog, fighting as they fall, and Frodo waking from a dream. From there I'm skipping forward several scenes, as the film then continues first with Samwise and Frodo, then to Merry and Pippin, before coming around to chapter two. Cinematically this serves to strongly hook us with this continuing story, as well as working around the issues of chronology in a story that jumps around, and the segregation the fellowship halves between books three and four. The movie wouldn't have worked out had Jackson ignored Frodo and Sam until halfway through. The hunting and tracking is far more concise, but the three don't fall so far behind. The patter between Gimli and Legolas has really found it's stride, adding a level of engagement that draws us in. Jackson adds in a build up that the books lack, or that they only show through Gandalf's exposition. Saruman is actively building up the conflict against Rohan, putting himself on a pedestal as Sauron's equal, and tying into the war-industry of Tolkien's time, "The old world will burn in the fires of industry!" There is also no question about the corruption of King Theodin, and the power of Grima Wormtongue over the court. We know how wrong things are in Rohan, and Eomer isn't just leading a hunting party but has been banished. The appearance of the Riders is way more impressive in the film than in the book, it's easy to forget how large war horses are. The look on Aragorn's face when Gimli demands a name of Eomer is priceless, that expression of "you're not helping" reads so clear. Jackson also cut out much of the posturing and discussion between the two groups, cutting neatly into continuing action, the finding of the burning corpses, and the infamous "Viggo breaks his toe" scene. Tracking the narrative from the book to the film will be a challenge, so I may miss sections going forward, but I'll do my best to follow it all.